(TNS)—My father used to say that you never put your hand on a hot stove more than once. It’s one of those “learn from experience” adages that I have never agreed with, especially when it puts a child at risk of serious injury. About 350 children age 19 and under are injured as a result of fire or burn-related causes every day, according to the National Fire Protection Association — a statistic reported by First Alert, which makes smoke and carbon monoxide alarms and fire extinguishers for homes. —Cook on the back burners when young children are present, and keep pot handles turned back, away from the stove’s edge. —During mealtime, place hot items in the center of the table, at least 10 inches from the table’s edge. Use non-slip placemats instead of tablecloths if toddlers are present. —Never drink or carry hot liquids while carrying or holding a child. —Keep fire extinguishers close at hand, and within easy reach of the cooking area. —Check smoke detectors regularly, and replace the batteries every six months. If you can’t remember the last time you replaced an alarm, change it. Smoke alarms should be replaced every 10 years. —Consider switching to voice alarms, which use a loud, pre-recorded and tamper-proof human voice to alert residents to smoke and also to the specific location of the hazard within the home. Studies show that children age 6 to 10 are wakened more readily by voice. —Keep all appliance cords — especially for items such as irons — coiled and away from counter edges. 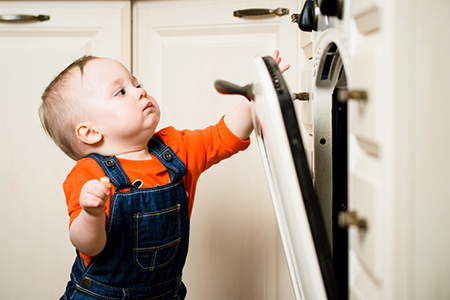 —Establish a “kid zone” out of the high-traffic areas near the stove, cords, and appliances, where children can safely play and still be supervised. Coincidentally, I just replaced the smoke alarm in our bedroom because a battery change didn’t seem to make it work properly. The replacement alarm cost about $13, including 7 percent New Jersey sales tax, and it took just 15 minutes to install.